If your kids always do what they’re told, consistently treat others with kindness and never over-react to unintended slights, you can skip this episode. If you look around and see misbehaving, undisciplined children everywhere, it’s not just imagination. Children today are fundamentally different from past generations. They truly have less self-control. Simply put, we face a crisis of self-regulation. 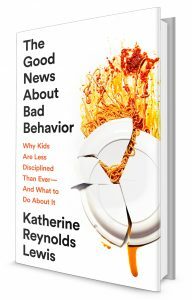 Lewis’s observations of her own children, and comments from other parents, led her on a six-year exploration of behavior, parenting and neurobiology — and points the way toward parenting techniques we can begin adapting right now to improve our children’s behavior. katherinereynoldslewis.com — Katherine’s author website. Contains a lot of info about her book and a complete list of her speaking gigs. 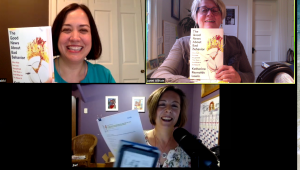 BuildingBoys private FB group — Jen’s online parenting community. We welcome parents of boys of all ages, but seem to specialize in helping each other navigate the tween and teen years. A consistently supportive community, filled with tenderness, honesty and compassion. Boys Alive! Supporting Parents and Teachers of Boys at Home and in School FB group — Janet’s online community. This supportive community stands ready to answer your questions, share their hard-won wisdom, and commiserate and send virtual hugs when needed. 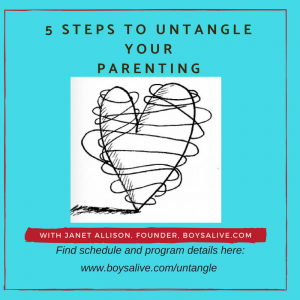 Janet invites you to explore these – and other – parenting concepts in her 6 week class: The 5 Steps to Untangle Your Parenting. Click here for more details and registration.